Fall lawn care is as important as what you do in the spring, because encouraging deep roots will help your lawn resist drought, require less fertilizer, and choke out weeds on its own. Begin and end the growing season with treatments of balanced fertilizer, just after the first mowing in the early spring and again in late fall. 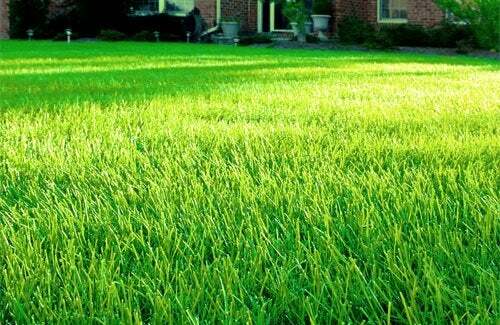 The key is to strengthen your lawn’s defenses naturally, without building up a chemical dependence. To protect your family, pets, and local water supply from exposure to dangerous petrochemicals, use organic or natural fertilizers, weed control products, and insecticides. While some lawns seem to do fine on their own, this bookend fertilizer schedule will help yours defend itself from fungus, disease, and extreme temperatures by strengthening its roots and encouraging strong new growth. But too much fertilizer can be worse than not enough. Cool season lawns of fescue, blue grass, or rye grasses can be damaged by fast acting or heavy fertilizers in late spring or summer.